Outpatients and visitors can select from two dining choices at St. Clair Hospital. Located in the Fourth Floor Lobby, Café 4 features gourmet coffees, soups made from stock, custom made salads and sandwiches, and baked goods. Many of the fresh in-season vegetables and fruits available at Café 4 are purchased from local farmers. Seating is available in the café, in a “soft seating” area just outside the entrance, and on the adjoining patio. Customers enjoy free Wi-Fi access throughout the area. Saturday-Sunday 9 a.m. to 4 p.m.
Café 4 locations can also be found at our Village Square and Peters Township outpatient centers. 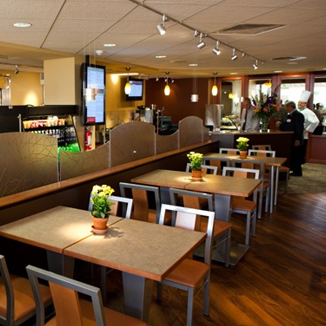 Offering a wide variety of menu choices, the Hospital cafeteria features daily entrée specials, a full breakfast menu, along with a complete soup, salad and sandwich bar. Menu items are prepared fresh daily. Daytime - 6:30 a.m. to 6:30 p.m.
Late Night - 1 a.m. to 3 a.m.